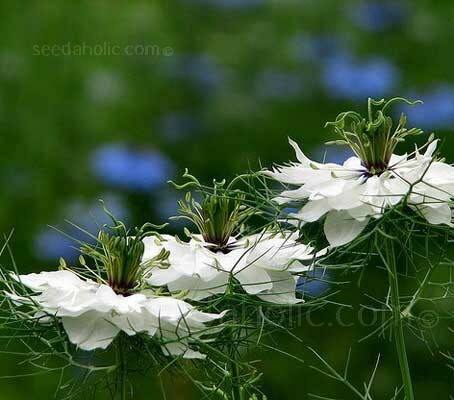 Nigella damascena, or 'Love-in-a-Mist' as it is commonly known is both beautiful and easy to grow. “Miss Jekyll White” is much less common than the usual blue varieties. It bears wonderful pure white flowers which seem to float amongst the finely cut leaves. One of the most interesting shaped flowers you will ever see, both for its blooms and attractive fennel-like foliage.They provide a charming show of bloom during the summer months. Love-in-a-mist grows naturally in rocky places native to Europe and North Africa, however, these flowers are well suited for traditional cottage garden settings or plant in a meadow where the soil is a little on the dry side and not too rich. A hardy annual flowering the same year, a popular cut flower and useful for bedding. Once the petals drop, the blossoms transform into little fairy lanterns and the seed pod can be dried for winter decoration indoors. 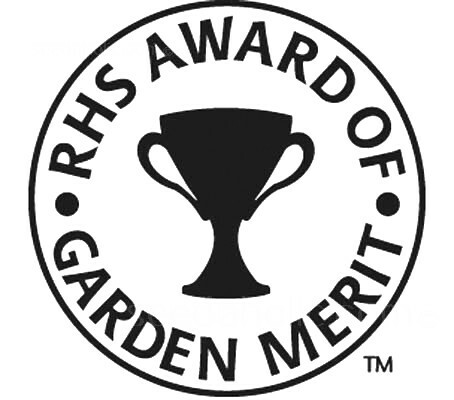 Nigella damascena alba has been awarded the RHS Award of Garden Merit (AGM). Seeds are best sown in short drills 0.5cm (¼in) deep directly where they are to flower. Sow thinly, once temperatures reach around 18°C (68°F). They prefer a sunny open site but will grow in most sites and soils. Prepare the ground well and rake to a fine tilth before sowing. Mark the sowing areas with a ring of light coloured sand and label if sowing more than one annual in the same bed. Sow 1mm (1/8”) deep in rows 30cm (12in) apart. Seeds germinate in approx 21 days. The seedlings will appear in rows approx 6 to 8 weeks after planting and can be told from nearby weed seedlings quite easily. Thin the seedlings out so they are finally 23cm (9in) apart by early summer. Compost should be kept slightly moist, but not wet at all times. An early autumn sowing can be made in sheltered areas for earlier flowers the following year. Planted it in the autumn it will send down a taproot and form a rosette of feathery leaves during the winter. As temperatures warm up in Spring, flower stalks shoot up. If it's a dry spring, give it water and it will grow large and erect. Without water it tends to flop over. Prefers well drained soil enriched with manure or compost ahead of planting. Can be grown on light sandy soils. Feeding is rarely needed but water well and apply complete plant food as growth begins in the spring. Nigella damascena 'Love-in-a-mist' is most valued as a beautiful, lacy ornamental in the garden and a colourful component of fresh and dried arrangements. Seeds of Nigella damascena have been used over the centuries as an aid in digestion and they are also used in cooking. The seeds taste somewhat spicy, some people note a resemblance to nutmeg, and have been used as a condiment and in confectionery, to flavour wines and snuff, and as an expectorant. They are far less flavourful than those of Nigella sativa, known as black cumin or fennel flower, which has had a greater culinary and medicinal role than N. damascena. The related Nigella sativa (and not N. damascena) is the source of the spice variously known as Nigella, Kalonji or Black Cumin. The genus Nigella is native to North Africa and southern Europe. It is one of about twenty species in the genus, all of them annual herbs from the Mediterranean region. Several are cultivated in gardens, and one, Nigella sativa, is grown for its aromatic seeds. The genus name is taken from the feminine of Latin nigellus, a derivative of Latin niger meaning black. The species name damascena, means 'from Damascus'. It originates from the area of what would have been Persia, now Syria. The word 'alba' refers to the white colour of the flowers. It derives from the Latin word album for a ‘writing tablet’ now used to mean ‘white’ in reference to the tablets historically being white. 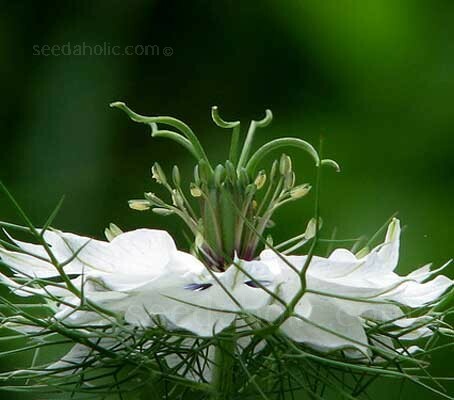 The plant's common name 'Love-in-a-mist' comes from the flower being nestled in a ring of multifid, lacy bracts. It's also called Devil-in-the-Bush. Jack-in-the-green and Lady-in-the-bower. In German, there are comparably poetic names like Jungfer im Grünen (Danish jomfru i det grønne) 'Maiden in the green' or Gretchen im Busch 'Maggie in the bush'. The cultivar is named after Gertrude Jekyll, 1843-1932. 'Miss' Jekyll, as she was known was probably the most respected gardener of her time, her influence on the art of gardening is evident throughout the world today. She designed about 400 gardens but, because so few survive and only a handful are accurately restored, it is by her books and articles that she is best remembered. She taught the world the full craft and art of gardening. She appreciated the beauty of both natural and formal styles and explained the importance of structure, proportion, colour, scent and texture in gardens of almost any scale. 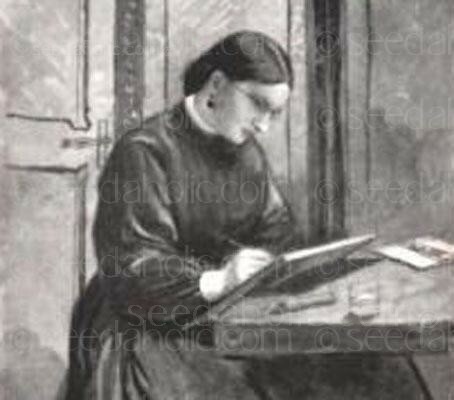 Her younger brother, the Reverend Walter Jekyll, was a friend of Robert Louis Stevenson, who borrowed the family name for his famous novel Dr Jekyll and Mr Hyde.